Chavin Old Temple Peru had jaguar human hybrid forms, but new temple was much more striking as 800 massive stone heads change from human to jaguar. "The most striking feature of the New Temple (from c. 500 BCE), which was actually an extension of the Old Temple complex, is the 100 surviving stone heads which once protruded from the exterior walls. These form a transformational series and progressively change from human to jaguar form. " and earlier in the same work "One of the most important Chavin gods was the Staff Deity, who is the most likely subject for the famous central figure on the Gateway of the Sun at Tiwanaku. Forerunner of the Andean creator god Viracocha, the Staff Deity was associated with agricultural fertility and usually holds a staff in each hand but is also represented in a statue from the New Temple at the Chavin cult site of Chavin de Huantar (see below). This half-metre figure represents male and female duality with one hand holding a spondylus shell and the other a strombus shell. Another celebrated representation from the same site is the Raimondi Stela, a two-metre high granite slab with the god incised in low relief as a non-gender specific figure with clawed feet, talons, and fangs in an image which can be read in two directions. A second important Chavin deity was the fanged jaguar god, also a popular subject in Chavin art." At its peak the centre had a population of 2,000-3,000 and covered around 100 acres. The Old Temple dates from c. 750 BCE and is actually a complex of buildings which together form a U-shape. In the centre, two staircases descend to a circular sunken court. The walls of the buildings are lined with square and rectangular stone slabs which carry images of transformational, shamanic creatures, carved in low relief. 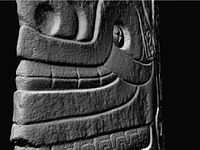 The figures mix human features with jaguar fangs and claws and they wear snake headdresses symbolising spiritual vision. The Olmecs gave special significance to the animals present in their environment, especially those at the top of the food chain such as jaguars, eagles, caimans, snakes and even sharks, identifying them with divine beings and perhaps also believing that powerful rulers could transform themselves at will into such fearsome creatures. The Olmecs also liked to mix animals to create weird and wonderful creatures such as the were-jaguar, a cross between a human and a jaguar, which may have been their supreme deity. We also know that they worshipped a sky-dragon and that they believed four dwarves held up the sky, possibly representing the four cardinal directions which, along with other Olmec gods, became so important in later Mesoamerican religions. In the religion of the Muisca, who inhabited the cool Altiplano Cundiboyacense in the Colombian Andes, the jaguar was considered a sacred animal and during their religious rituals the people dressed in jaguar skins. A Chinchorro male mummy bears the earliest tattoo found in the Americas. He has a mustache-like dotted line tattooed above his upper lip; the tattoo dates to c. 2300 BC. The Azapa Phase of local cultural development (4,000‐2,500 BP) was a transitional period between the end of the Chinchorro Phase and the start of the Alto Ramírez Phase. These developments took place in the Azapa Valleynear the coast. Around 4,000 BP, the people of the Azapa Valley saw some cultural changes brought by immigrants from the Altiplano. These influences led to the adoption of agriculture c. 3,000 BP, as well as the introduction of ceramics. These later groups no longer mummified their dead. The influence of the early Andean cultures in northern Chile has been studied by several archaeologists. Especially the influence from the Wankarani culture, and the early Pukara culture from the Lake Titicaca area may be relevant here. During a transitional phase, the Chinchorros may have coexisted with an emergent Andean Tradition along the coast. To say that the people of Peru have an intimate relationship with the San Pedro cactus would be unjust. Love spewed out of the green flesh and into the veins of their ancestors, exploding into a ray of light that opens even modern day consciousness. Tune in my friends because there is a story here to be told. A story of such magnitude, that 3000 years have not changed much of its story. The term San Pedro comes from Saint Peter and is said to have been the key holder to the gates of heaven. This visionary teacher opens the doors of perception and allows us to enter the Spirit world; thus, allowing communication with the divine. In traditional folk healing, those who drink San Pedro’s nectar open the flood gates to discover divinity and find purpose. The Huachuma or San Pedro (Trichocereus pachanoi, T. peruvianus and T. bridgesii), the sacred cactus and the visionary teacher plant of the South Americas, is especially associated with the shamans and curanderos of the Peruvian Andes. When European settlers first landed in this portion of the Americas, they brought with them Christianity. This event dramatically changed the indigenous cultures. European Christianity literally invaded the original region where the use of San Pedro indigenously evolved. One could only imagine what they would have thought; witnessing natives’ use of psychoactive plants and particularly, cutting up cactus and drinking the internal goodness. In perspective, couple the use of psychoactive plants with the ceremonial partaking and a negative picture is naturally painted. For thousands of years, natives from all over the continent have accepted the journey to the great temple of Chavin de Huantar (modern day Ancash) located in the northern highlands of Peru. Chavin de Huantar is a four to five hour journey from Huaraz and is an archaeological site of the Chavin culture. Furthermore, this site is located on a steep slope of the Andes Mountains of Peru; occupied from about 900-200 B.C. Small stones between large blocks were used to create an extremely strong structure. The plaza has survived 3000 years of earthquakes and has increased in strength over time. With each quake, a small stone shifts to an unyielding position. Chavin de Huantar was first described by a Spanish chronicler in 1521. Chavin is an early (750-400 BC) ceremonial site at the meeting point of three passes. The plaza is perfectly circular and 20 meters in diameter. In Addition, its rivers drain into the Maranon River and then on to the Amazon. The Old Temple was built during the late Initial Period and was the “center of supernatural power and authority.” For instance, the Old Temple had a sunken platform in a U-shape opening to the east as well as a circular courtyard in the center. The Old Temple also consisted of numerous passageways and underground chambers called galleries. These galleries were used for storage chambers, religious rites, and possibly temporary or permanent living for small groups working with temple activities. The Lanzon Gallery is located at the center of the Old Temple. This was where the sculpture of the Lanzon was discovered but since moved. The Lanzon, the supreme deity of Chavin de Huantar, is anthropomorphic. With its feline head and human body, it has intertwined the feline deity of Chavin de Huantar and the shaman of the pre-Chavin period. Dating back to 1500 B.C., the earliest known depiction of Huachuma is from the circular plaza of the Old Temple at Chavin de Huantar in the northern highlands of Peru. The site and others of the Chavin culture were investigated by Julio C. Tello between 1919 and 1941; more recent investigations include Luis Lumbreras and Richard Burger. As a result, many artifacts have been discovered on the hills. Stone sculptures are scattered along the site; usually carved out of white granite and black limestone. In addition to the stone sculptures, carved stone mortars and pestles, conch-shell trumpets, bone tubes and spatulas, and metal spatulas and spoons have been discovered decorated in Chavin style. Peruvian ceramics made between 1000 and 700 B.C. depict the plant in association with deer. 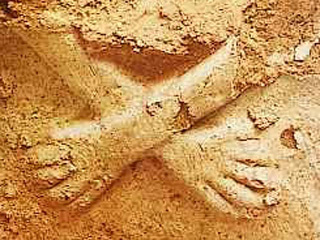 Similarly, another image includes an owl-faced woman holding a cactus. This comes from a ceramic pot from the Chimu culture, dating back to 1200 A.D. According to native beliefs, the owl is a tutelary spirit and guardian of herbalists and shamans; therefore, the owl-faced woman depicted is most likely a curandera (healer) and huachumera. Another fascinating discovery, by Peruvian archaeologist Rosa Fung, includes a pile of ancient refuse at the Chavin site of Las Aldas near Casma. Namely, the pile of ancient matter seems to contain remnants of cigars made from the cactus. The remnants contribute insight into other uses of the Trichocereus cacti. Nevertheless, modern day shamans are only known to use the plant as a liquid brew that is prepared and saved in jars. Mescaline, 3,4,5-trimethoxyphenethylamine, is the active compound responsible for the effects of the San Pedro’s hallucinogenic brew. Mescaline is unique among drugs. This is because the main action is a stimulant of the visual and visuo-psychic areas of the cortex. 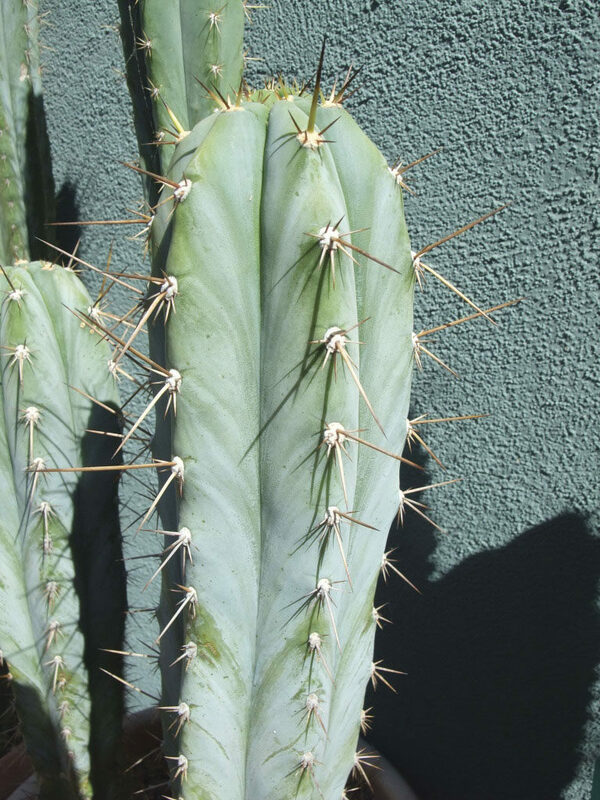 Mescaline is found concentrated in the green outer flesh of the cactus with up to thirty other alkaloids. While unaware of the scientific aspects of mescaline at the time, curanderos knew of this spiritual significance. To the Chavin people, the green flesh of the cactus was a powerful medicine and psychological healer; hence, grounding them to the heaven and earth and interconnecting their souls with the gods. Additionally, shamans acquired power and authority by claiming they walked in the footprints of the divine. The curandero seeks to perceive unity in the dynamic interaction between the forces of good and evil. They do this through their visions. Shaman achieved a high social status somewhat like that of a preacher/president hybrid. This status was effectively used in the preservation of the sacred cactus. However, the plants vigorous growth and climate aids in modern day availability. The use of Achuma is believed to have been related to the phases of the Moon. In general, nocturnal ceremonies take place during Full Moon nights. On the other hand, there is evidence to suggest more broad use patterns. The ritualistic use traditionally started with the ingestion of a hallucinogenic liquid extracted from the San Pedro cactus by the shaman and his patients. The Chavin people would have gulped down the concoction somewhere outside of the oracular centers sacred site of the old temple. Afterwards, they would have been led to a tunnel passage to start a journey into the temple. The Tiwanaku perfected a type of agriculture which raised crops from the ground. Lowered canals innervated the mound-like crops, and during the day, the crops absorbed water and canals absorbed solar radiation. During chilly nights, the heat radiated into the soil, preventing crops from freezing. The warmed canals also served a secondary function: providing a water source to farm edible fish. Aside from their unique achievements in agriculture, the Tiwanaku also had an equally curious architectural style, employing massive ashlar blocks sometimes as heavy as 130 tons quarried 40km away. They built temples and platforms as large as 200 meters on each side and 15 meters tall. According to some hand-me-down stories, myths passed down to the Incas and then to the Spanish, these buildings served as spiritual centers. Fittingly, structures like the Gateway of the Sun have representations of their main deity, Viracocha. Other statues represent other deities, sometimes even abstract representations of a calendar and religious purposes. The archaeological region of San Pedro de Atacama is located in the Atacama Desert of northern Chile, at an altitude of 2450 meters above sea level. In pre-Hispanic times, the area was occupied by a succession of pre-ceramic hunters and gatherers and ceramic-stage agriculturists and herders. 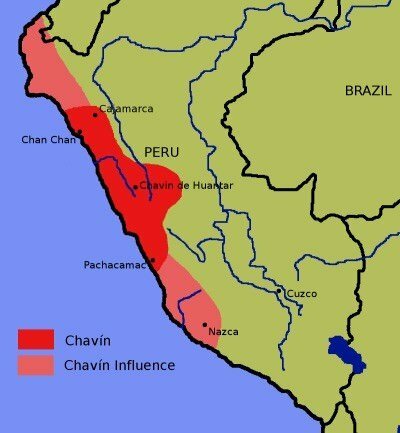 These pre-Inca peoples established their habitation sites around oases and river valleys. San Pedro de Atacama, one of the largest oases of the Atacama Desert, is composed of small settlements centered along the lower course of the San Pedro River. This is a rich archaeological area where the dryness of the environment allows for the excellent preservation of textiles, bone and wooden artifacts, and of human remains, which become mummified by the arid climate. One notable feature of the San Pedro culture is the high incidence of snuffing implements. The most common of the snuffing kits found in San Pedro de Atacama consists of a woolen bag containing a wooden rectangular snuff tray, a snuffing tube made usually of wood or bone, a spoon or spatula, a small mortar and pestle, and one or more leather pouches used as containers for the snuff powder. All of these objects could be present in any particular set, although frequently only tubes, spoons, and snuff powder containers are found. A total of 612 snuffing kits have been found in 42 of the approximately 50 sites excavated in the area. The methods of execution include incised line, low relief carving, and sculpture in the round. The size and chronology of the sample indicates that approximately 20-22% of the adult male population was using psychoactive snuffs circa 200-900 AD. After the tenth century AD, the practice of snuffing practically disappears in the area; finds of snuffing paraphernalia are rare in Inca settlements after 1480 AD in the Atacama Desert. The use of a tray and a tube as part of the snuffing paraphernalia is widely distributed throughout South America. Snuff trays have been found as far north as northern Colombia and as far south as Calingasta, San Juan Province, Argentina, and Coquimbo, IV Region, Chile. The temporal distribution of these objects is also of great amplitude. The oldest trays and tubes known from all of South America are those excavated by Junius Bird and Frederick Engel on the north and central coasts of Peru and dated circa 1200 BC. The presence of these implements in an archaeological setting is a clear indication of the use of psychoactive snuffs. Twentieth-century snuffing practices have been documented among numerous groups of the Amazon basin. The botanical identity and the chemical makeup of archaeological snuff powders have only been recently determined. Until now the evidence has largely consisted of descriptions by early European chroniclers and comparisons between archaeological artifacts and those from the Amazon collected within the last two hundred years. Two samples of archaeological snuff powders found in tomb #112 of the pre-Hispanic site known as Solcor 3 in San Pedro de Atacama were submitted to chemical analysis. The site has been dated by a series of seven radiocarbon dates and six ceramic samples dated by thermoluminescence. The dates range from 320 to 910 AD. The approximate date of tomb #112 is 780 AD, as determined by radiocarbon dating and comparisons with artifacts found in other dated tombs. The mummy bundle of tomb #112 had two snuffing kits inside multicolored textile bags, each located at shoulder height on the left and right sides of the body. Each bag held a rectangular snuff tray, a simple snuffing tube, two leather pouches containing the snuff powder, and a small spoon. The analysis demonstrated the presence of the psychoactive alkaloids dimethyltryptamine (DMT), 5-methoxydimethyltryptamine, and 5-hydroxy-N, N-dimethyltryptamine (bufotenine) in both snuff samples. The finding of bufotenine in the San Pedro de Atacama snuff samples suggests that the plant source of this material was a species of the genus Anadenanthera. This is the only genus implicated in the snuffing complex that contains bufotenine. In addition, small pouches containing Anadenanthera seeds have been found in Solcor 3 in contexts corresponding to the same period as the analyzed snuff samples. These psychoactive tryptamines have a rapid and strong onset of effects, producing radical modifications of states of consciousness, as well as of cognitive and perceptual patterns. Anadenanthera colubrina is the species native to the south central Andes and the southern Amazon basin periphery, and most likely was the plant used in San Pedro de Atacama. Use of Anadenanthera colubrina snuff continues among the Mataco people, who inhabit the area of the Bermejo and Pilcomayo rivers, on the border between Argentina and Paraguay. Further support for A. colubrina as the source of the archaeological snuff powders is provided by the early chronicles of the European explorers of South America. They refer to powders prepared from the seeds or beans of a tree. According to Oviedo y Valdes, writing in 1535, the cohoba snuff of the Taino of the Greater Antilles was obtained from a tree whose pods contain lentil-shaped seeds. In 1560 Fray Pedro de Aguado described the yopo snuff of Colombia as prepared from the seeds or beans of a tree. Bernardo de Vargas Machuca, writing in the sixteenth century, and the Jesuit explorer José Gumilla in the eighteenth century both described the source of snuffs as the seeds of a tree. Later, in 1802, Alexander von Humboldt, during his travels in the Amazon, observed among the Otomac the use of a snuff prepared from the fermented seeds of a tree. In 1850 the English botanist and explorer of the Amazon, Richard Spruce, also witnessed the preparation of a snuff powder from the seeds of a tree. The situation is similar in the Peruvian Andes where the early chroniclers such as the sixteenth-century writer Santa Cruz de Pachacuti reported snuff preparations based on seeds or beans. The iconography of the snuffing paraphernalia comprises a large variety of themes and motifs, including staff-bearing figures, decapitation scenes, and a variety of zoomorphic depictions. Notable among these are feline, avian, and camelid representations. Feline and bird imagery is frequently associated with psychoactive plant use throughout the Americas. However, it is in San Pedro de Atacama that camelid representations acquire significant importance in this context. Throughout the pre-Hispanic world, psychoactive substances were considered intermediaries between the human and the supernatural realm; as such, they were capable of participating in the interpretation and creation of cultural elements. The study of the objects utilized in the ingestion of psychoactive substances could provide the opportunity to explore the relationship between hallucinogens, the construction of complex iconographic systems, and state formation in the Central Andes. Incised Strombus-Shell Trumpet, 400-200 B.C.E, Brooklyn Museum. This shell trumpet was probably made for ceremonial use. The incised designs depict a person of high rank, indicated by his facial tattoos and ankle ornament, playing a shell trumpet. The figure is surrounded by snakes, including one that emanates from the instrument. The twisting and intertwined snakes may indicate the power of the trumpet to communicate with supernatural beings. The Lanzón at Chavín, still image from a video of a photo-textured point cloud using 3D scanner data collected by nonprofit CyArk. The Chavín culture represents the first widespread, recognizable artistic style in the Andes. Chavín art can be divided into two phases: The first phase corresponding to the construction of the "Old Temple" at Chavín de Huantar (c. 900–500 BCE); and the second phase corresponding to the construction of Chavín de Huantar's "New Temple" (c. 500–200 BCE). Chavín art is known for its complex iconography and its "mythical realism". There is constant evidence within all types of art (ceramics, pottery, sculptures, etc.) of human-animal interactions, which was reflective of societal interconnections and how the Chavín people viewed themselves connected with "the other world". Some other iconography found in Chavín art continues to give a glimpse as to what the culture was like, such as the general evidence of the use of psycho-active plants in ritual. The San Pedro Cactus is often seen on various art forms, sometimes being held by humans, which is used as evidence to support the use of the plant.